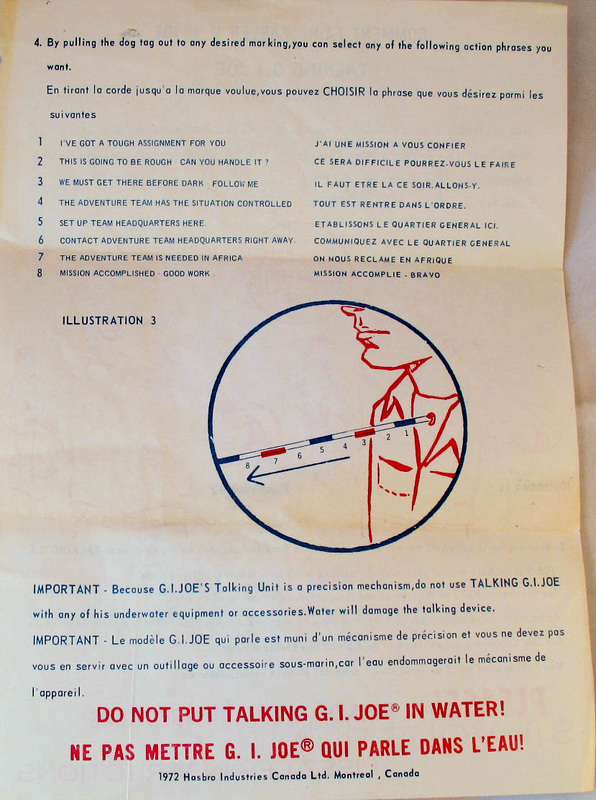 The Talking Adventure Team Commander (7400) speaks eight different commands, all listed on his box insert shown below. You can listen to them by playing the audio clip above. He was released in a number of uniforms, the first principal one (above) being cut similarly to the Green Beret set, but of a slightly darker material and tagged Hong Kong rather than Japan. He is also found in overstock of Soldiers of the World uniforms, including the British, Russian, and German and overstock of the original Green Beret uniform. See an example of a blonde headed Commander with the Russian uniform below, along with the standard brown hair version wearing the British SOTW uniform. Later AT era Commander uniforms reduced the number of pockets. Details of these versions will be added below in the near future. Below, the eight commands. 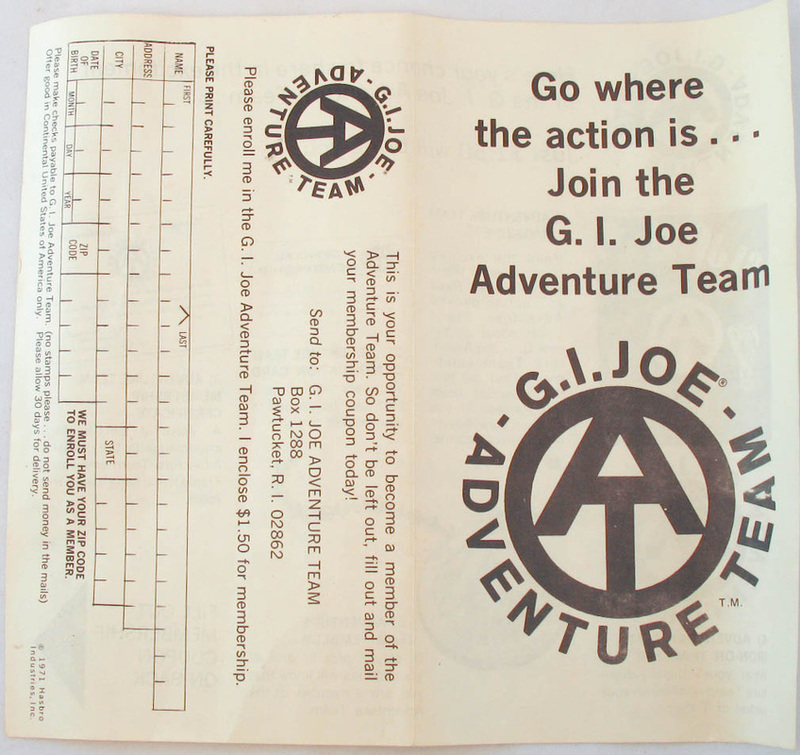 This earlier version of the insert is printed in three colors. 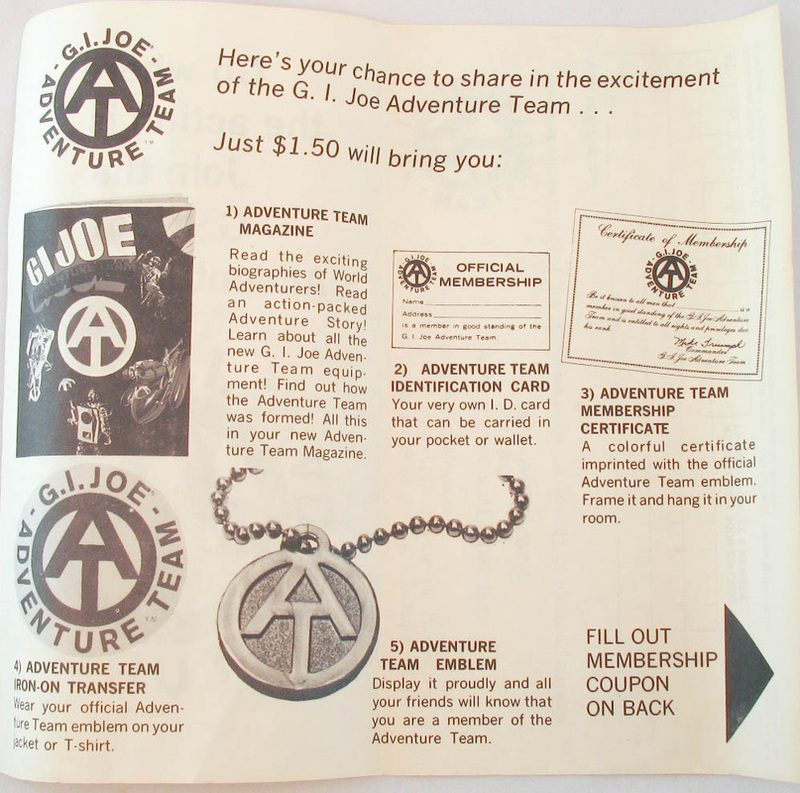 The club insert encouraged kids to Join the Adventure team. Kids in Canada got their own French speaking version of the Commander. 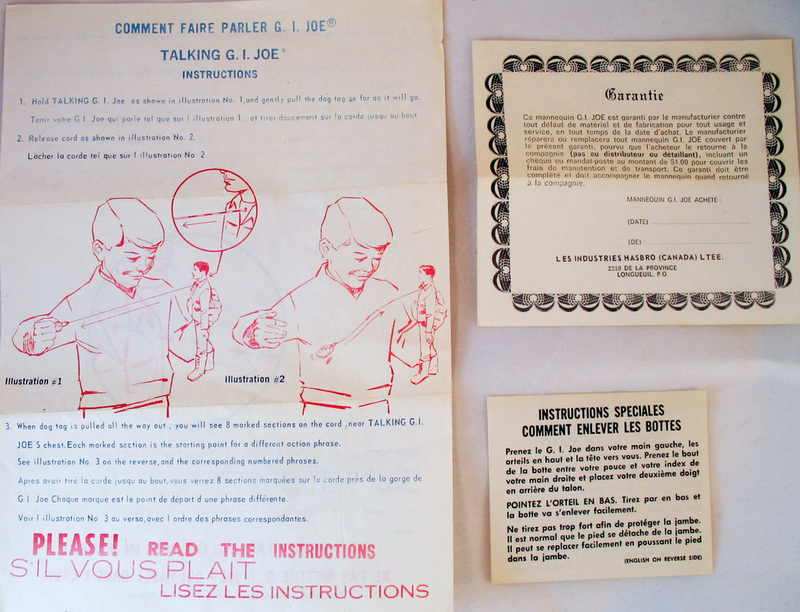 The first version of his box simply has a 'Je Parle Francais' sticker, while the later version has a more bilingual box. 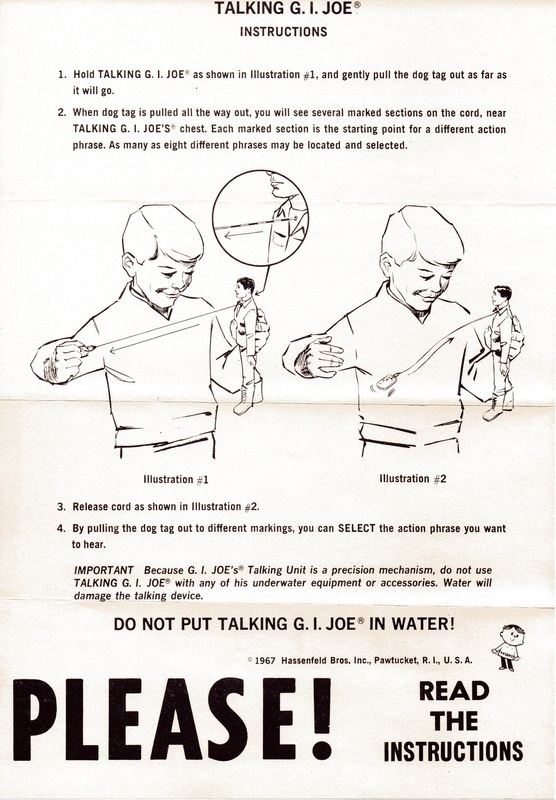 A similar sticker and then bilingual box also appears for the KFG version of the figure. Hear his commands by playing the audio clip! 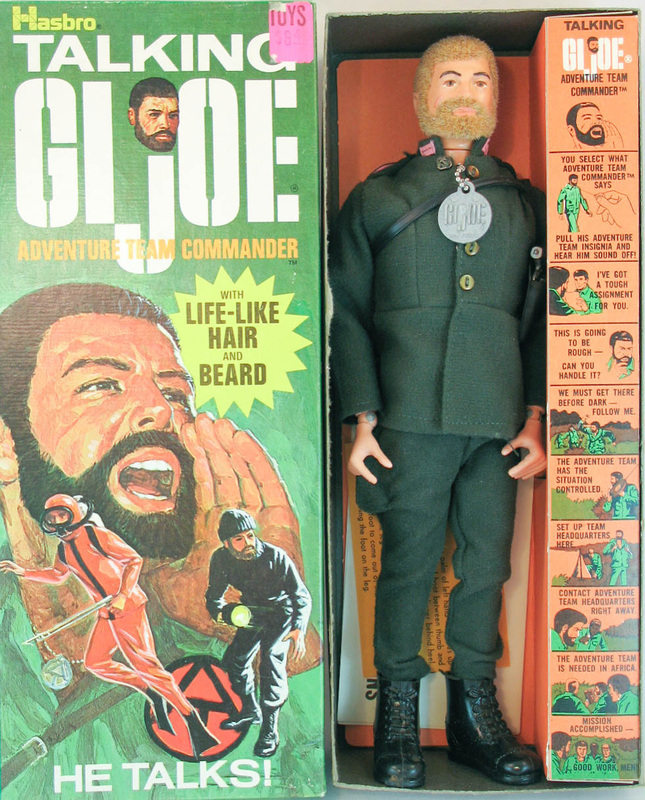 The Talking Commander above features both a blonde head and a surplus Russian Soldiers of the World uniform. 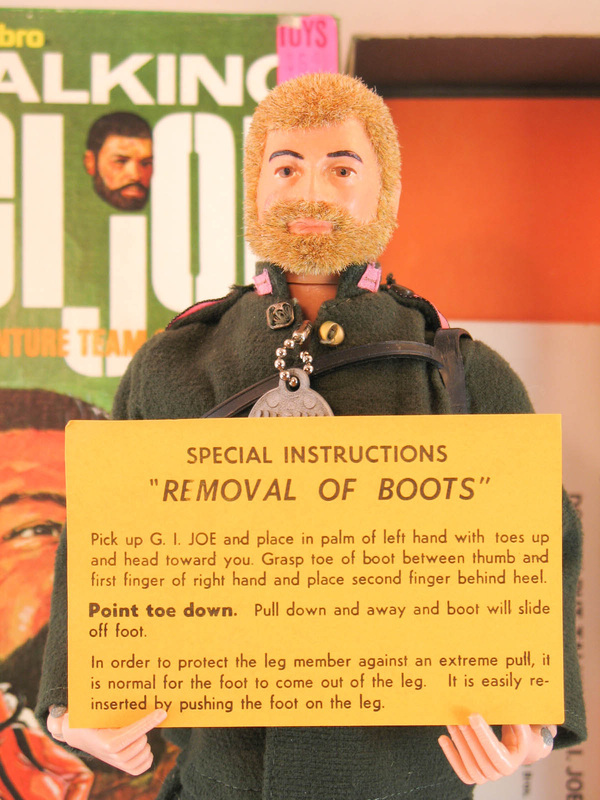 As an added bonus, this oddity includes boot removal instructions printed on yellow paper, something I have not seen elsewhere. Here the standard brown hair version appears in the British Commando's uniform. These first run AT figures may have been dressed in SOTW overstock to use up remainders or because the overseas suppliers were late providing the correct uniforms, or both. Any documentation on the topic would be a welcome find.